"Ryoko no tomo”of TANAKA was first made in 1916. 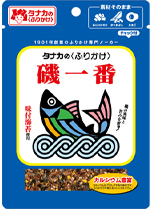 The authentic taste values the natural taste of small fish,laver from the Seto insland sea, sesame and egg. 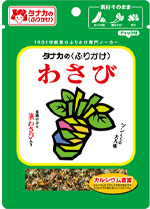 Getting the best out of the natural ingredidents, this is traditional and signature Furikake,rich in calcium. 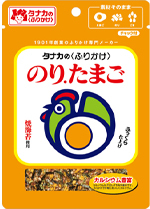 ●One serving(about2.5g)contains calcium of 40cc milk ,3 to 4 dried sardines. 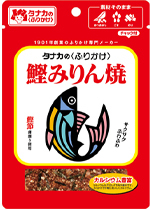 Furikake with a good balance of good quality crispy shaving dried bonito roasted with Mirin, laver and sesame. A package with a zipper. Furikake mixed with crispy shaving dried bonito and plenty of seasoned laver. A package with a zipper. Furikake mixed with fluffy granulated egg and savory laver. A package with a zipper. 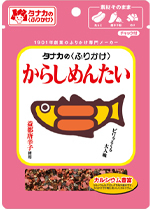 Hot flavored tasty salted cod roe Furikake.A package with a zipper. 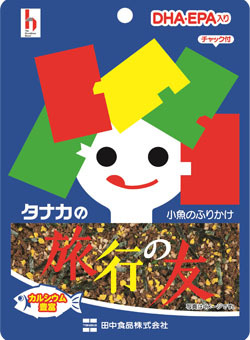 Authentic and colorful pungent Japanese horseradish Furikake. Also good as condiments for Somen noodle and fermented soy beans.